Last night, after a scare from the tough Indiana Pacers, the Miami Heat's "big three" of LeBron, Wade and Bosh advanced to the NBA Finals. Unlike the other major North American sports, in basketball, it is possible for teams with just three great players to dominate. In baseball, football and hockey, with dozens of players per team each with very defined roles, the presence of three great players alone won't get you to the championship. U.S. agriculture is a lot like basketball. Over the past few decades, the big three of corn, soybeans and wheat have come to dominate U.S. agricultural land. Yet, as in basketball, the basic parameters of the game have not changed. The court - the amount of land used to grow crops - is the same size it was back in the 1930s, despite the players getting larger and more skilled. This spring, planting of the big three crops account for an estimated 231 million acres of agricultural land. That is, by my estimate from USDA data, roughly two-thirds of all cropland, and 87% of cropland devoted to major crops (i.e. not fallow or idle). 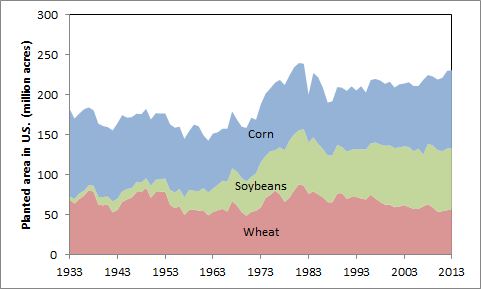 Outside of brief soybean-driven surge in the early 1980s, there is currently a greater amount and proportion of cropland being devoted to corn, soybean and wheat than ever before. The current surge is driven largely by the use of corn for ethanol, as well as the continued demand for soybean and corn for animal feed. The Heat's opponent in the Finals are the San Antonio Spurs. Though the Spurs have their own big three - Duncan, Parker and Ginobili - the team is best known for its tough coach who makes use of every role player on the bench. It is a true clash in styles. I'll be curious to see who wins. Posted by Unknown at 10:33 a.m.